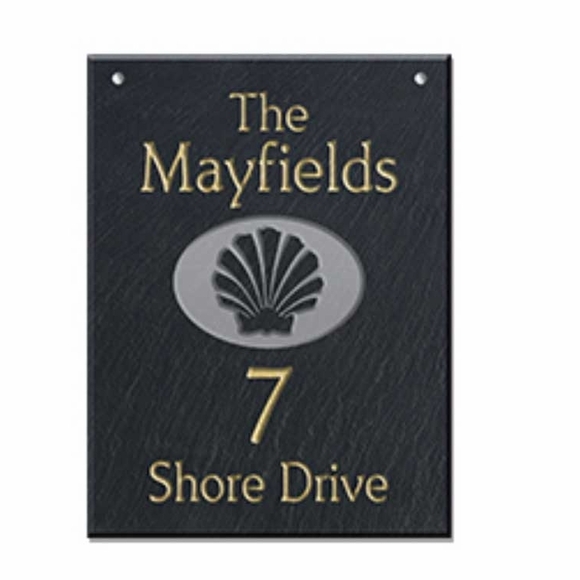 Hanging Address Sign with Seashell - - slate address sign. Custom plaques features a large seashell in the center. Personalized with the family name, house number, and street name you supply. Made in USA. The one-sided sign has the name & address you supply and the seashell on the front only. The two-sided sign has the name & address you supply and the seashell on the front and the back. (Note: personalization is exactly the same on both sides). Vertical orientation with four lines of text and a large seashell in the center of the sign.